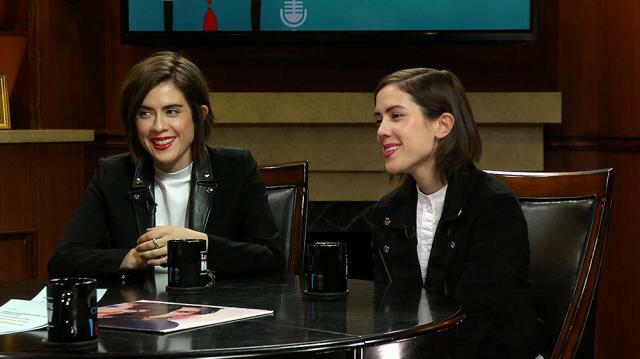 Tegan and Sara Quin explain why they say they have a tendency to attract otherwise straight women, pointing to some of the stereotypically male characteristics they exhibit. Larry King: You recently said 'Sara and I always say we're not just lesbians. We are lesbians, but there's always been something about Sara and I where there's a certain kind of straight girl who's really into us. What did you mean? Tegan Quin: Well actually it's really interesting, because there's been obviously so much, I mean the last couple years, such a shift, people talking about gender and gender identity in the spectrum. And Sara and I have always called ourselves tomboys, but that never quite encapsulated how I felt about myself. And I think, I think for Sara and I it wasn't just about being lesbians. I think we are, like, there is something masculine about us. I think we can be very feminine, and I think we're very much comfortable with our feminine side. But I think Sara and I, we're also, we're leaders- some of the traits that are most apparent and visible in us are masculine traits. Like, or things associated with being masculine. So we're very confident, and we're very aggressive, and we're leaders. And I think oftentimes the kind of girls we attract are not always attracted to women, and then they meet us and, dominos. Sara Quin: What everyone is afraid of in society. Larry King: Does that show up, Sara, in your music? Sara Quin: I mean, you know, I will say this. I think that, you know, Tegan and I sort of present ourselves very naturally, comfortable, the way we learned to sing was very natural. But often, I don't know that we take on the sort of, you know, we don't necessarily sound like other girls. We don't sing like other girls. You know, sometimes I think that we were very comfortable being strong and confident and aggressive in our music in a way that I think sometimes women, even on a subconsious level are sort of made to think like, 'Oh, we shouldn't be like that. You should be pretty, or you should be gentle.' And I think Tegan and I sort of always, just, we took our cues from the music that we grew up listening to, like punk rock and rock music. And a lot of times, theh people who were fronting those bands, male or female, were... Yeah, there was a confidence, or a bravado, and I think we have that.